The team at eSportBet.com has recognised a severe lack of eSports guides out on the World Wide Web which adequately cover the basics of betting on eSports. We want fans of eSports to be able to bet real money on their favourite players and teams properly and safely, so if you are a complete newbie to online eSports betting or betting in general, read our guide to understanding odds and markets before you get started on placing bets on your favourite esports games and teams. How do I actually bet on eSports? Betting on eSports is actually just like betting on traditional sporting events. In eSports, the most basic known form of betting is match winner or match win, also referred to as a Moneyline bet (Pinnacle), Head-to-Head (BetEasy), Straight (William Hill) and many other terms depending on your preferred online betting site or social circles. The premise is very simple: you place a wager on which team you think will win the match, after deciding on the odds which represent the best value for your hard-earned money. Betting odds represent the probability of a given outcome, which in our case is the outcome of our favoured eSports team winning, and odds can be represented differently depending on where in the world you’re betting from. As eSports are played with international audiences, there are several odds formats used by betting sites to express betting odds: decimal, American (also known as moneyline) and fractional. Depending on where in the world you are from and which site you sign up with, you will need to learn how they work before you start betting. Due to its simplicity, the most common format used by online betting sites is decimal odds, which we will use in our examples throughout this article. Please note you must be over the age of 18 years old to sign up at online sportsbooks and bet on eSports. Sorry, kids, but this is the law the world over. Okay – so in our beginner’s example of a basic match winner bet, we want to place a bet on Athletico vs Team Immunity in a game of CS:GO, with Team Immunity to win. We need to break down the three basic factors every punter needs to consider before placing the bet. Format: The odds format the Internet bookmaker/sportsbook you have chosen uses – decimal, fractional or American. Odds: The actual amount the bookmaker/sportsbook will pay out on a winning wager, together with the required stake. Bankroll: The amount of real money you wish to bet with. The hypothetical bookmaker we have chosen uses decimal odds format. 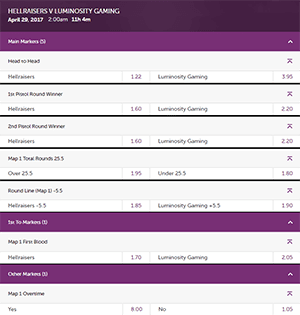 The hypothetical odds are 1.60 for Athletico to win, compared to Team Immunity at 2.50. The amount of real money we wish to bet with is $100 stake (maximum – set yourself a limit). We choose to place a $100 bet on Team Immunity to win. The sportsbook calculates our potential return from this wager on our betting ticket, by multiplying our stake of $100 with the odds they offer. To work it out for yourself, the formula is stake x odds = expected return. In this case, it’s 100 x 2.50 = 250. If Team Immunity wins, our return is $250. This includes our original $100 bet, called a stake, and your total profit, which is $150. To work out our total potential profit, just subtract one from the given odds. The formula shifts to stake x (odds – 1) = actual profit. In this case, it’s 100 x (2.50 – 1) = $150. The betting odds offered by bookmakers reflect their implied probability of a team winning a match over another. The lower the odds, the probability is higher the team will win in the bookmaker/sportbook’s view. The higher the odds, the team has a lower probability of winning in the bookmaker/sportbook’s view. In this particular example, we would win significantly more on Team Immunity at $2.50 than if we had placed the same bet on Team Athletico at $1.60. If we had, following the formula it would be 100 (stake) x 1.60 (odds) = 160 (expected return). Subtracting one from the given odds and multiplying it with our stake would grant us an actual profit of $60 if our wager wins. The bet on Team Athletico is arguably a better value wager given they are considered by the sportsbook to have a 62.5% chance of winning the match – essentially, a higher probability of the given outcome we are betting on (match win). We get lower returns, but the bet is considered better by the sportsbook offering it. Just like in every other sport, race and novelty category people place real money bets on, a variety of factors such as your knowledge of the teams playing, their skill levels, quirks, individual strengths and weaknesses and even favouritism influence your final decision as to which outcome is the better bet. While many other esports guides and websites often advise to always simply bet on the value bet every time, we stress the importance of taking the time to research the aforementioned factors before placing your wagers. For example, in our aforementioned example we may have decided to bet on Team Immunity based on a downward slump experienced by Team Athletico in several matches prior to the tournament we are betting on. Or perhaps, as fans, we have recognised Team Athletico’s loss of a key player to internal fighting, and we are guessing a major upset could occur in our favour. 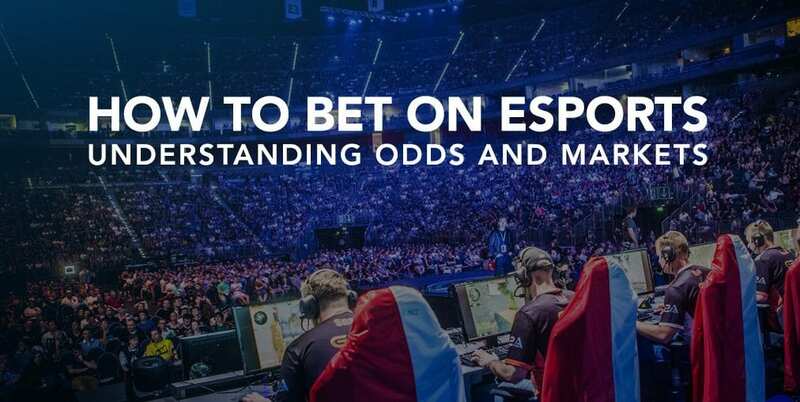 Before we dive into those factors in more detail with links to our dedicated guides and database of player and team profiles for esports bettors to utilise, we want to break down the types of bets you will see offered at online sportsbooks for our favourite esports titles. The basic straightforward match winner bet option is often the only betting market open on our favourite eSports games, but every game has slightly different types of special wagers unique to its style of gameplay. For example, CS:GO’s fast and frantic first-person shooter gameplay allows exciting wagers to be placed on the team who wins the first Pistol Round of any given match, while League of Legends’ real-time strategy gameplay allows players to wager on which team kills the baron or dragon miniboss first. These kinds of wagers aren’t dependent on whether the team you’re betting on wins the entire match, but are based on another outcome entirely. Many sportsbooks are still playing catch-up when it comes to offering more exotic and varied wagering options, but thankfully there are several types of these other bets we can place on eSports, as detailed below. These are the main betting markets available in the majority of eSports video games at Internet and mobile sportsbooks. Draw: You are placing a bet on whether the outcome of the match results in a draw. Group of Winner: You are placing a bet on the group which contains the overall final winner of the entire tournament. Group Winner: You are placing a bet on the winning group of the specified tournament (if teams are organised in groups). Handicap bet: When a sportsbook places a set margin (called the line) which gives an unfavourable team a small advantage (usually in the form of rounds) and effectively places the game on equal footing. It is only available when there are only two possible outcomes (two teams). You are placing a bet on whether the team with the handicap advantage or disadvantage wins. Example: You place a bet on Team A, which has a 3 round advantage against Team B. The final score is 8 – 10, but with the 3 round handicap, Team A wins with the revised score of 11 – 10, which means your wager is paid out. Outright Winner: You are placing a futures bet on the which team you think will be the overall winner of the tournament in question. Over/Under: You are placing a bet on the number a sportsbook predicts for a particular statistic in a given game (most often combined score of the two teams, also factors such as total kills and first to markets); whether the actual number in the game is either higher or lower than the bookmaker/sportbook’s odds. Region Winner: You are placing a bet on the specific region the winner is from, if the tournament separates them by region. Total Rounds: You are placing a bet on whether the overall match will go over or under a certain number of rounds. These are more exotic types of betting markets available in multiple eSports video games at online and mobile sportsbooks. First Blood: You are placing a bet on the team who scores the first kill of the match (Counter Strike: Global Offensive, League of Legends). Knife Round: You are placing a bet on the team who scores the first kill of the Pistol round (Counter Strike: Global Offensive). Knife Round/Pistol Round: You are placing a bet on the team who scores the first kill of the Knife Round, when available (Counter Strike: Global Offensive). Map Winner: You are placing a bet on the team who wins the specified map (Counter Strike: Global Offensive, DOTA 2, League of Legends). Read our dedicated guides for each esports game for a list of the game-specific betting markets/types of bets unique to that video game, listed and linked below. First Baron or Dragon: You are placing a bet on the team who kills the first Baron or Dragon (League of Legends). First Inhibitor/Tower: You are placing a bet on the team who kills the first inhibitor/tower (League of Legends). Map 1 Overtime: You are placing a bet on whether Map 1 will run into overtime (Counter Strike: Global Offensive). How do I deposit money to place bets on esports? All licensed and regulated online sportbooks have a variety of globally trusted banking methods to deposit money to bet on esports and withdraw any potential winnings safely. Credit and debit card via MasterCard, Maestro and Visa are the most commonly accepted and recommended option due to its high level of proven security, along with digital payment services like AstroPay, Bitcoin, Boleta Bancario, Neteller, PayPal, PaysafeCard, POLi and Skrill. Visit our guide linked in this section for more in-depth information on the best deposit methods for esports betting in your country and currency. Know the game: There is no point putting hard-earned cash down on a team or player if you aren’t familiar with the competitive gameplay of top-tier eSports games like CS: GO, League of Legends and StarCraft II. It may sound absurd, but there is an alarming rate of casual eSports fans jumping straight into placing bets without sufficient knowledge of the game in question. Don’t let yourself get caught up in the excitement or the assumed simplicity of placing a straight bet on the most popular team – often times you’ll walk away without cash return and diappointment. It’s common sense, and applies to anyone and everyone placing a real money bet on any live sport. Sign up to BetOnline, one of our top recommended esports betting sites for both beginners and experienced bettors, to get your exclusive welcome sign-up bonus and have a punt on CS:GO, Dota 2, League of Legends, Overwatch and more games.